When/where: Aug. 4, 4-8 p.m. and Aug. 5, 11 a.m.-8 p.m., Spokane Arena parking lot. Cost: $25/advance (plus fees), $30/door; good for both days, includes 13 drink tickets (2-ounce pours for one ticket, 10 ounces for five). Onsite parking $6-$10. The Spokane Brewers Festival returns for a second year Aug. 4-5 with a few new wrinkles. Forty breweries and cideries will pour in the Spokane Arena parking lot, up from last year’s 34. It’s a week earlier than last year’s event, to avoid scheduling conflicts. Ticket pricing has changed. Last year you bought a tasting mug and wristband good for both days for $7, and drink tickets for $1 each. This year, it’s a package deal including 13 tickets for $25 in advance, $30 at the door (extra tickets still $1). Advance ticket fees range from $1 at the Arena box office to $4 online, so that’s more a convenience than a bargain. And in maybe the biggest difference, the Arena has partnered with the hunger relief organization Feeding Washington. That not only adds a charitable aspect, but under state liquor law allows brewery employees to pour their own beer, unlike last year – one of the biggest complaints by brewers and customers alike. One thing hasn’t changed: Like last year, temperatures are expected to top 90 degrees. Tents will again provide shade, Gibson said, and misting fans will be better positioned to cover more ground. “It was real hot and sticky last year, but everybody seemed to be smiling,” he said. Area breweries signed up for this year include Badass, Bellwether, Bennidito’s, Big Barn, Black Label, Downdraft, Four-Eyed Guys, Hopped Up, Hunga Dunga, Iron Goat, Little Spokane, New Boundary, No-Li, Northern, Orlison, Post Falls, Rants & Raves, River City, Steam Plant, Ten Pin, Top Frog, TT’s Old Iron, V Twin, Waddell’s and Young Buck. Also look for Central Washington’s Icicle, Iron Horse and Yakima Craft, Western Washington’s Elysian and 7 Seas, Oregon’s Ordnance, Montana’s Great Northern and California’s Lagunitas. Cider comes from Jester & Judge, North Idaho, One Tree, Summit, Tieton, Washington Gold and Whiskey Barrel. Each will serve at least two offerings. Among the more distinctive are a wine barrel-aged watermelon gose from Four-Eyed Guys, a Sunburnt Shandy blend with peach and mango puree by Black Label, Big Barn’s raspberry braggot (honey beer) and Young Buck’s Ludicrous Speed triple IPA. There will be an assortment of food trucks and local bands will perform starting at 4 on Friday and 1 on Saturday, with the stage more centrally located this year. Admission is free for children (accompanied by parents) and designated drivers, who receive complimentary River City root beer. You also can bring your own nonalcoholic beverages and food. 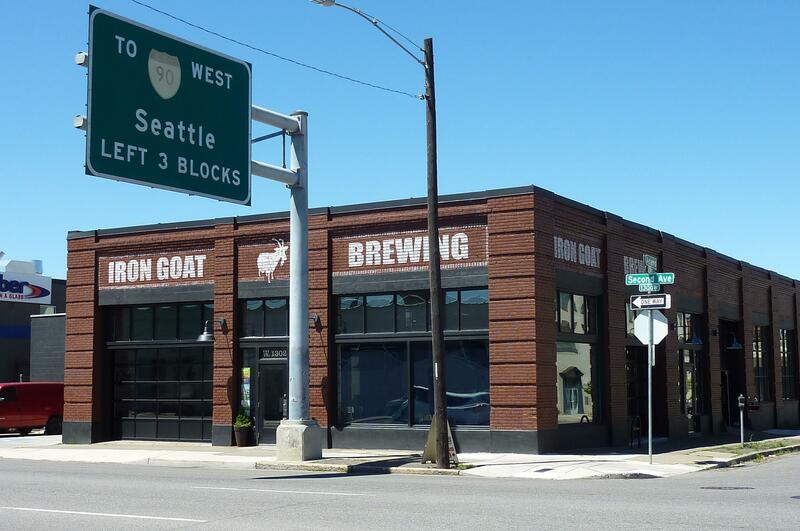 Iron Goat, which has more than doubled its production capacity since moving downtown last spring, has begun distributing to Western Washington. No-Li has left the Oregon market, at least for now, to meet growing demand in Washington and Idaho. Work continues on Twelve String’s larger new location at First Avenue and Pines Road. The taproom could move by year’s end. Construction is well underway at Millwood Brewing on Frederick Aveneu off Argonne Road, which hopes to open at the end of October. Nu Home Brew is in the final licensing stages to make and serve its own Genus Brewing beers in the Spokane Valley supply shop, possibly as soon as mid-August. Iron Goat’s latest offerings include a Let it ESB extra special bitter (5.3 percent alcohol by volume, 29 International Bitterness Units) and spicy 2nd Avenue Saison (7.4, 30). Bennidito’s has followed its single-hop Ella India pale lager (6, 50) with a Mandarina session IPL (4.6, 48) starring citrusy Mandarina Bavaria. Little Spokane’s Knothead Northwest Session Red (4.8, 35) is light but flavorful with a pronounced hop character. Whistle Punk’s recent additions include a spruce tip red (6.4) and a big but drinkable imperial IPA (9.6) hopped with Mosaic, Amarillo and Columbus and double dry-hopped with Citra. The Peach Perfect peach/pumpkin wheat (7.3, 18) has returned at Daft Badger. The Coeur d’Alene Growler Guys’ Battle of the Breweries on Saturday starting at 5 will feature two beers each from Mad Bomber, Paradise Creek, River City, Slate Creek and Waddell’s. Bellwether is following up February’s Purple Egyptian barley project with a new series of small-batch beers brewed with another ancient variety, Scot’s Bere, each Thursday next month starting Aug. 3. Community Pint, a 24-tap beer bar, growler station and bottle shop in the former Jones Radiator at 120 E. Sprague, is set to open Aug. 4. For a full listing of local beer events and news see www.spokane7.com/blog/ontap. Published: July 25, 2017, 12:30 p.m.